The Nokia Lumia 625 is one of the last smartphones by Nokia, putting an end to what has been a bumpy ride for the Finns in the modern phone era. Whether the Lumia line will find greener pastures under Microsoft remains to be seen, but one thing's for certain - the Lumia 625 will be one of Nokia's last Lumia releases. Oh well, the 625 certainly won't qualify as Nokia's loudest bang on its way out - that honor belongs to the Lumia 1020 flagship.Or, if we're lucky, a certain phablet may be the gadget to remember them by. Back to the point though, the Lumia 625's main attention grabber is the healthy boost in screen size. By going from 3.8" to 4.7", the Lumia 625 gains almost a full inch in screen diagonal over its predecessor. This, along with LTE support, higher clock speed and full-HD video recording, highlights the primary advantages of the Nokia Lumia 625. For a more complete list of specs, you can refer to the following list. Thanks to the larger screen and resulting larger dimensions, the Lumia 625 feels like a marked improvement over its predecessor. 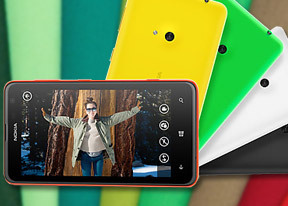 But bigger is not necessarily better, and the Lumia 625 may learn it the hard way. Big screen on a budget sure sounds nice, but WVGA on 4.7" could be too much of a stretch. And it's not a ClearBlack display either, which may as well be the only downgrade compared to the original Lumia 620 - along with the missing NFC chip. No upgrade to the 512MB of RAM is potentially a minor disappointment, which can quickly be put to rest if the Lumia 625 behaves in our tests. The extra 700mAh of battery capacity is also a welcome addition. Up next, we'll get started by unboxing the Lumia 625 and proceed with a closer look at the design and build quality. We're waiting for lumia 625 to be updated to windows 10. Please we love our phone!!! what is wrong with this phone sometime? ?the phone just hangs,you cant re start neither can you put it off..you cant remove the battery to re start...it stays for almost 6 hours or 7 to re start by itself.any advice pls? ?